☕ Good Wednesday morning. Today is Day 33 of the government shutdown. ⚡ SOUTH BEND, Ind. (AP) — "Democrat Pete Buttigieg, the 37-year-old mayor of South Bend, Indiana, is forming an exploratory committee for a 2020 presidential bid." 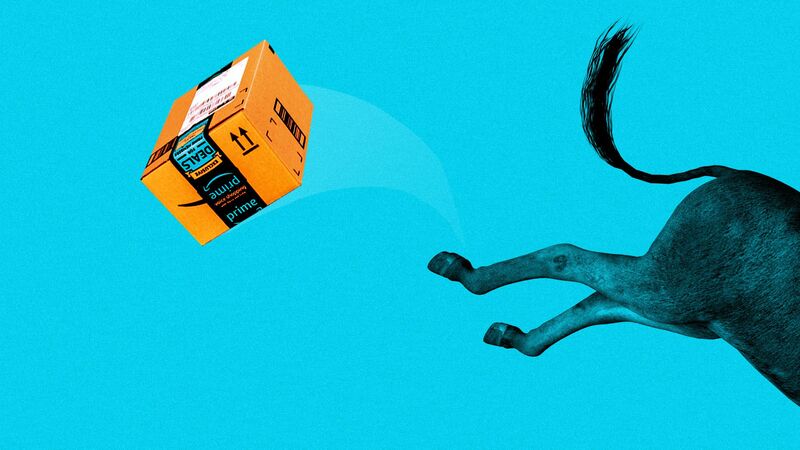 Amazon has become a recurring symbol of economic inequality for newly emboldened progressive Democrats, Axios' David McCabe reports. Progressive advocacy organizations, including MoveOn.org and New York’s Working Families Party, have raised money or built their contact lists via complaints about the company, according to ads archived by Facebook. "[A]ll large institutions of any kind, whether they be government agencies, nonprofits, universities, and certainly including big corporations, deserve to be inspected and scrutinized." An Amazon spokesperson noted that while the firm had recently turned solid profits, it was unprofitable for a long time. Amazon does not rank among the most profitable companies on the most recent Fortune 500. Be smart: Amazon polls very well. Democrats recently told Georgetown University researchers that they had more confidence in the company than any other institution — including universities, the military, Google and the FBI. Flashback: For years, Democrats married their economic message with attacks on Walmart. Walmart responded aggressively, and so has Amazon. A new immigration idea has been circulating over the past 24 hours at senior levels inside the White House and on Capitol Hill: Give a path to green cards to the 700,000 current DACA recipients, three sources familiar with the conversations tell Jonathan Swan. Republican senators, including James Lankford of Oklahoma, have advocated for this idea. And Jared Kushner has relayed the idea to his colleagues in the White House as a possible way to break the congressional deadlock. Seven Democratic senators would be needed to pass a package. A senior Democratic Senate aide tells Swan that three or four Democrats, at most, would support Trump's proposal. And maybe not even that. Her letter didn't formally disinvite Trump, and the White House wants to make Pelosi go ahead with the speech or formally rescind the invitation. "Secret Service says: 'We have no problem doing our job,'" a senior administration official told Jonathan Swan. 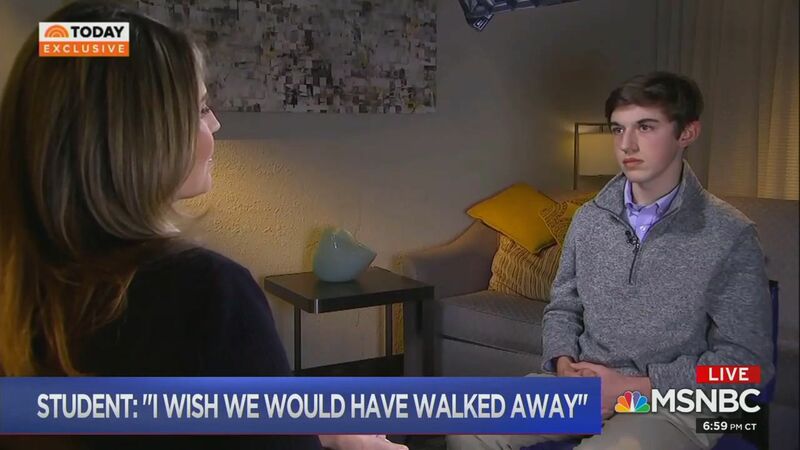 Covington Catholic student Nick Sandmann tells NBC's Savannah Guthrie, in an interview airing this morning on "Today," that he "had every right" to stand in front of Nathan Phillips, but now wishes he and his classmates "would have walked away and avoided the whole thing." "I respect him. I'd like to talk to him." "Our hasty condemnation of these teenagers reveals the cold truth about hot takes." "We react to news by trying to fit it into the argument that we routinely make, the grievance that we usually raise, the fury or angst or sorrow that we typically peddle." And his fellow columnist David Brooks asks: "Will the Covington Catholic High School fiasco change social media?" "In this technology, a single moment is more important than a life story." "Mortgage rates are up after years near historic lows. Price increases have been outrunning paychecks. And at a target price that families with a median income could afford, fewer homes are for sale." New data: "In the past year, the availability of homes that a middle-class family could buy has declined in 86% of the largest metro areas, according to an analysis of 49 cities being released [today] by the real estate brokerage Redfin." "There had been an improbable synergy between the two men: the president who covets power but has little sense or discipline in wielding it, and the legislator who has often seemed to consider the skillful exercise of power an end unto itself." "He was the Trump administration’s indispensable partner in seating two Supreme Court justices and 83 lower-court judges: a generational remaking of the courts." Leonard Leo of the Federalist Society, an adviser to the Trump administration on the court appointments, said McConnell is "in my view, the most consequential majority leader, certainly, in modern history." 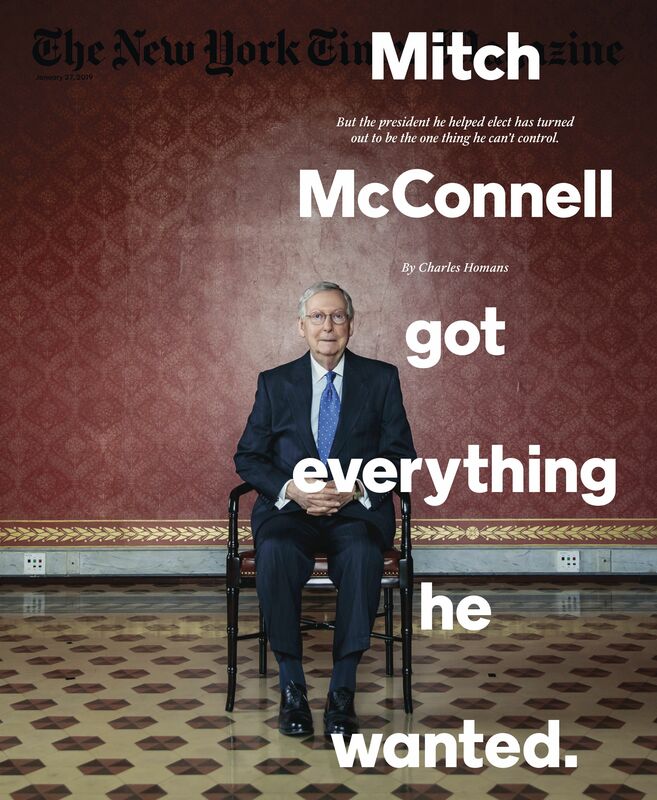 "McConnell, who has represented Kentucky in the Senate for 34 years and ... is the longest-serving Republican leader in Senate history, is one of Washington’s most famously inexpressive creatures." "On Jan. 9, he stood stone-faced alongside Trump in a Senate hallway as the president suggested he would get his wall money by declaring a national emergency. 'I don’t think much of that idea,' McConnell told me the following day. 'I hope he doesn’t go down that path.' Still, he admitted, 'I’m perplexed as to how this ends.'" Key quote: "Far be it from me to complain about obstruction," McConnell said, permitting himself a chuckle. "But generally, when I’ve been involved in obstruction, there was a point to it." 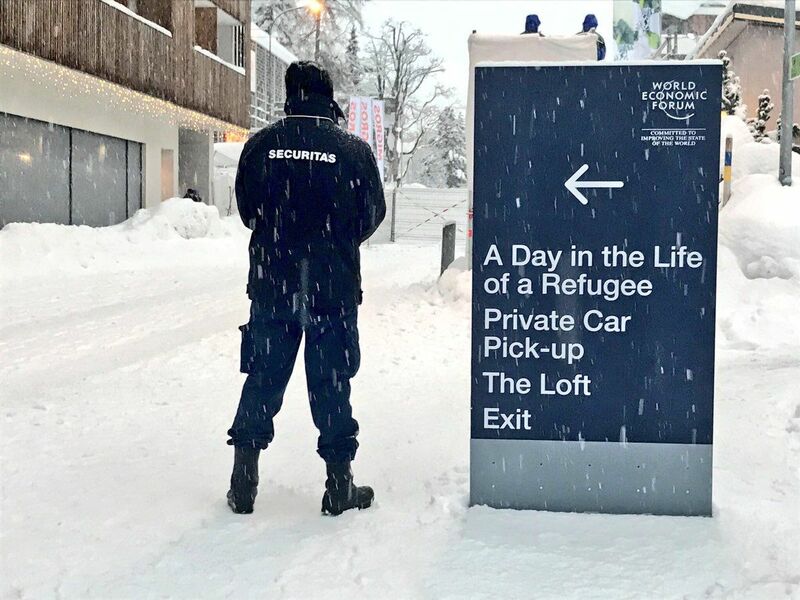 The Trump administration is hoping to capitalize on popular outrage in Venezuela — along with burgeoning consensus among regional leaders opposed to the regime — to help loosen President Nicolas Maduro's grip on power, Axios' Dave Lawler (in Davos!) and Jonathan Swan report. President Trump huddled at the White House yesterday with Vice President Pence, national security adviser John Bolton and Florida politicians — Sens. Marco Rubio and Rick Scott, Gov. Ron DeSantis and Rep. Mario Díaz-Balart — to discuss Venezuela. Pence delivered a video message to the Venezuelan people declaring Maduro "a dictator with no legitimate claim to power," and "recognizing the National Assembly as the last vestige of democracy" in the country. Maduro responded by ordering what he called a "revision" of diplomatic ties with Washington. Rubio and Scott left the meeting hopeful that Trump would soon go one step further. The backdrop: In the midst of a devastating economic recession that has forced 3 million Venezuelans to leave the country, Maduro was sworn in earlier this month for a new six-year term after a sham election. The regional picture: Latin America is shifting to the right and support for Maduro’s socialist regime is drying up. Brazil’s new right-wing president, Jair Bolsonaro, said yesterday in Davos that his election and those of like-minded leaders were a sign that "left-wing ideology will not prevail in the region." Michael McCarthy, a research fellow at American University, says Maduro has survived perilous moments in the past, but "what’s different this time is he has just never dealt with headwinds this strong internationally." 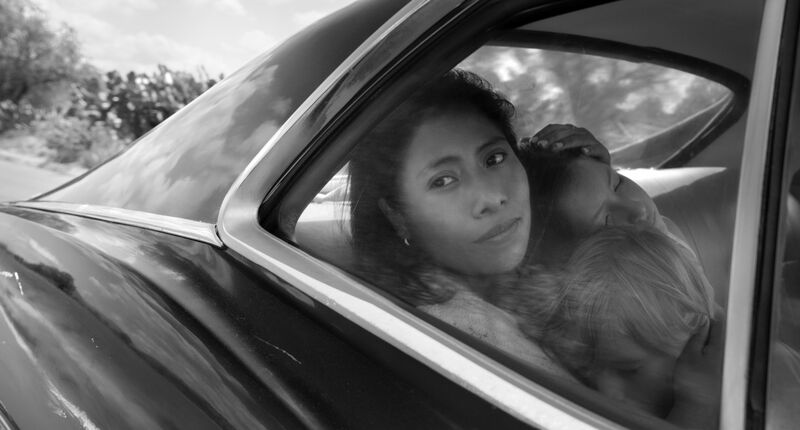 The Motion Picture Association of America (MPAA) added Netflix as its first streaming member. The other MPAA members are the six major studios. Why it matters, from Axios' David McCabe: This is a major shift in the Washington influence battles, as the company looks to join traditional movie studios and leaves the Internet Association, which represents tech companies. Netflix is signaling a move away from its tech roots as it builds its content library. "[G]oing back to the first Hall of Fame class of 1936 — in which Ty Cobb, Babe Ruth, Honus Wagner, Walter Johnson, and Christy Mathewson were elected — no player has been named on every ballot." "Prior to Rivera's election, Ken Griffey Jr. held the record ... with 99.3 percent in 2016." "Now that Rivera has quenched the drought, unanimous Hall of Famers should become more commonplace." "Don't be surprised if Rivera's long-time Yankee teammate, Derek Jeter, becomes the second unanimous Hall of Famer when he hits the ballot for the first time in 2020."